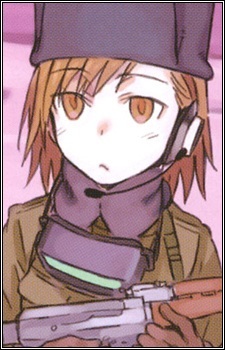 MISAKA 10777 is a Misaka Mikoto clone that appears in Toaru Majutsu no Index. Originally supposed to be killed in the experiment against Accelerator as part of the Level 6 Shift, she was later transferred to an organization in Russia. She meets Mikoto for the first time when she drops into Russia after the supersonic plane she was in, was destroyed. 10777 stated that after the evacuation of the organization supported by Academy City was complete she stated that she was spending the rest of the time to spend on her private business. In Volume 22, she and Mikoto work to disable all the nukes from being detonated and defeating forces from either Russia or Academy city to prevent any casualities. After that the two take a VTOL to the Star of Bethlehem in an attempt to rescue Kamijou Touma.